The dispatch center processed 497 phone calls this last week, receiving 18 911 calls, answered 68 calls for Meeker Police Department (MPD) and placed 160 outgoing phone calls. A total of 140 calls for service were created, 92 for the Sheriff’s Office, 43 for MPD. Two traffic crashes occured in the county, one involving a deer. (Please note the department breakdown of calls reflects a different number because of incidents with multiple agency response). The Sheriff’s Office conducted 38 traffic stops issuing six citations and MPD had 10 stops and issued one citation. Highway 13 south had 17 traffic stops issuing three citations. Other calls for the Sheriff’s Office included 10 agency assists, two 911 hangups, five animal calls, 13 civil papers served, eight BLM wildland fires, four motorist assists, two suspicious incidents and one each: civil, disturbance, illegal dumping, narcotics, SAR, traffic hazard, warrant arrest. MPD calls included five agency assists, two 911 misdials, five animal calls, four civil issues, two juvenile problems, two motorist assists and one each: burglary, business check, citizen assist, disturbance, fraud, harassment, narcotics, parking violation, suspicious incident, theft, traffic accident, VIN inspection and warrant arrest. There were eight calls for Meeker Fire and Rescue including one medical transfer, one alarm, two ambulance requests and four wildland fires. 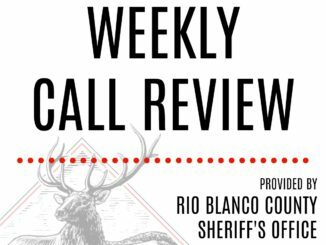 Rio Blanco Detention facility booked in four and released six, four from RBSO and one each from MPD and Colorado State Patrol. There are currently nine inmates in the facility.